to the All Saints alumni who made the Honor Roll at Notre Dame High School in Fairfield for the 2nd marking period! "At an acceptable time I have listened to you, and on a day of salvation I have helped you." Lent begins this week. The days of Lent prepare us to celebrate Easter and welcome new members into the church. It is a time to strengthen our union with Jesus and to join with him on his journey to Jerusalem where he was crucified. Throughout Lent the church constantly reminds us that by dying Jesus brought us new life and taught us how to live as people of God. During Lent we are invited to undertake this journey through prayer , fasting and almsgiving. We pray for ourselves and others. We give something up. We share our time and ourselves more generously with other people. These traditional Lenten works remind us that denial and struggle-take up our cross each day - are essential to living as disciples of Jesus. They help us prepare for Easter, the greatest celebration of the liturgical year. All religion classes will attend Stations of the Cross once a week during Lent. The Stations (or "Way") of the Cross are a special devotional prayer to help the children to recall the tremendous love of Jesus Christ as He suffered and died for our salvation. This Wednesday is Ash Wednesday. Ashes will be distributed during a short prayer service at 10:00AM. Fr Ralph, parochial vicar of St Thomas the Apostle Parish in Norwalk, will lead us in prayer . All are welcome to attend. 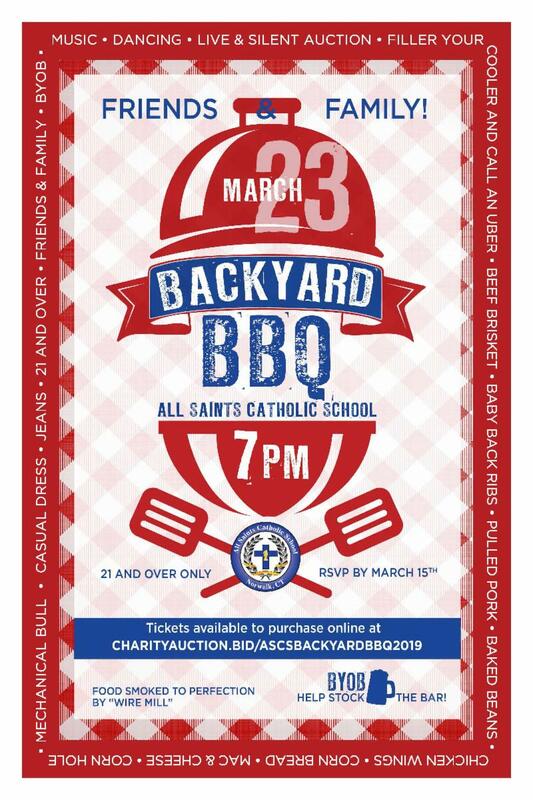 Our "Backyard BBQ" Spring Fundraiser event (adults only) is Saturday, March 23rd, 7 pm at All Saints! The last day to RSVP and purchase tickets is this Thursday, March 15th. Don't miss out on what promises to be a great party and fun way to support our school. And, mechanical bull, enough said! Remember, all proceeds will benefit our wonderful school. The ticket prices includes amazing BBQ and all the fixings. This event is BYOB, so fill a cooler and get ready to have some fun! The IOWA Tests of Basic Skills and COGAT Cognitive Abilities Tests will be administered to all students in grades 1-7 of the Diocese of Bridgeport (including All Saints Catholic School ) beginning Monday, March 11. Grades 2, 4, 6 and 7 will take the IOWA's and grades 1, 3, and 5 will take the COGATS. The areas tested are for the most part reading, writing, and math. The results of these tests will become part of your child's permanent record. The tests test your child 's critical thinking skills and will give us valuable information about your child's strengths and weaknesses in language arts and math. They will also assist the administration and teachers in assessing our curriculum maps to inform instruction. It is important that your child eats a good breakfast and gets plenty of rest during testing time. It is also important that your child is on time for school each day. Any questions concerning testing can be directed to the assistant principal, Ms.Licare (ms.licare@ascs.net). Every family is a valued member of our school community. Tuition assistance is available through the Bishop's Scholarship Fund to those who apply and qualify. The application process is now open . Deadline to apply for returning students is March 15. Please visit the school website for information. If you have any questions, please contact the school office to set up an appointment to discuss ways to continue to make Catholic education happen for your family. The Drama Club will be presenting three performances of "The Little Mermaid on Friday evening, April 5 at 7 PM , Saturday evening, April 6 at 7:00PM and a matinee on Sunday, April 7 at 2 PM. Thank you to Mrs. Maurya Brown, our music teacher and Drama Club moderator. The students have been working hard since September. Please plan to come out to see a great performance! Tickets go on sale today! Visit our school website for information to purchase tickets or pick up an order form in the office. It's the most wonderful time of the year - the Book Fair is almost here! Please visit us in the ASCS Gym on Monday March 11th through Friday March 15th. Hours on Monday through Wednesday are 7:30am until 3:30pm; Thursday hours are 7:30am - 12:30pm; Friday hours are 7:30am - 11:00am. There will be a story hour on Tuesday March 12th from 6:30pm-7:15pm. Join us for songs, games and great stories - Parents, shop while your children play and sing! The fair will be open from 5:30pm - 8:00pm that night. Grandparents - come to our "Grand" opening event on preview day Friday March 8th from 2-4pm. All grandparents shopping the fair will receive 10% off. Do you love the smell of new books? Can't wait to be the first one to turn a new page? Then we have the perfect volunteer opportunity for you! Come help out for a few hours at the book fair. Sign up using this link. Please join us on Friday night, April 5, for this year's "Art Show." Students in Grades PK3 through grade 5 will showcase their artwork in beautiful frames in the gym from 6PM to 8:30PM. Frames with student art will be available for purchase for $25 by check made payable to All Saints Catholic School. Please arrive prior to the closing time because the breakdown begins promptly at 8:30PM. More information can be found on the school website. The Harlem Wizards Game has been rescheduled for Wednesday, March 27, at 6:30PM. Tickets purchased for January 30 will be honored that night. Additional tickets are for sale online now. There will be an early dismissal on March 14. It is an in-service day for teachers. Dismissal for preschool is at 11:30AM. Dismissal for everyone else is at 11:45AM. The extended day program will be held for working parents until 5:45 PM.